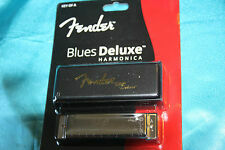 Fender Blues DeVille Harmonica Key of A , New! Hohner Special 20, key of A in excellent condition with hard plastic case. The Hohner Model 560 Special 20 was one of the first diatonic harmonicas in the world with the reed plates recessed into the comb, creating a projecting plastic mouthpiece. 5 out of 5 stars - Seydel SESSION Harmonica w/ Black Leather Case! - Pick Your Key! 7 product ratings7 product ratings - Seydel SESSION Harmonica w/ Black Leather Case! - Pick Your Key! Set of 12 Harmonicas. All 12 Keys! The Johnson Blues King harmonicas have a professional sound from brass reeds that are recessed into their shell. This prevents air leaks and allows for generous note bending. With their excellent response and great tone, diatonic harmonicas from HOHNER have earned a worldwide reputation for the finest quality. Available in 12 major keys as well as a special Country Tuning, which features a major 7th when played in the cross harp position. The best sound and durability SUZUKI MANJI M-20 A 10 hole harmonica. Body is warm and the trees sound a tone, resin that combines the ease of blowing and durability, natural wood fiber reinforced solid body was blessed with each of goodness. Vintage Germany M. Hohner Marine Band Harmonica No.1896 Key of A Original box and travel case Nice piece. Minimal wear from use and age. Hering's Chromatic Harmonica in key of A. Appears to be in good condition with no missing screws or parts. They belonged to my father who passed away. 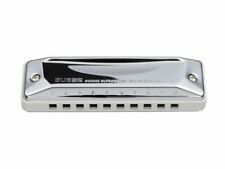 New Huang Silvertone Deluxe Diatonic Harmonica with Case. Quality Built Harmonica that Feels Great in the Hand. Great Sound / Great Tone! 0.9 mm Brass Reed Plates. You never know what kind of interesting treasures I'm going to have for sale. 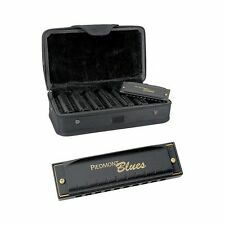 Harmonica Carrying Case is constructed of high-impact plastic with solid aluminum, creating maximum harmonica protection, while still being light weight. The case holds up to twelve 10-hole diatonic harmonicas and one chromatic (up to a 16-hole size). The lead free copper reeds can be made to vibrate at varying frequencies to produce a beautiful sound and distinct tone. Available in the keys of A, Bb, C, D, E, F, G.
Lucky 13 Bass Blues Harmonica - Two harps in one! 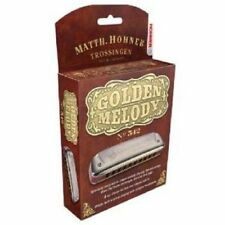 Suzuki Humming Harmonica is the most famous/best choice of tremolo harmonicas and known in the community. The reed plates are tightened using screws, therefore it is easy to disassemble and doing the cleaning job. Yonberg D2 WIND Harmonica - ( Keys of A ) NEW! YONBERG D2 WIND HARMONICAS. TheD2 WIND is equipped with high quality Seydel Brass reeds. Technical specifications of D2 "Wind". Reed plate with special high quality brass reeds made by SEYDEL. The Fender Blues Deluxe harmonica is designed to be versatile for all levels of players. Its classic tone and pitch is made possible with a molded PVC comb and brass reeds. Reed plates are also replaceable. 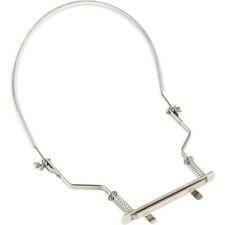 Double wing nuts are lock your harmonica into playing position. Comfortable rubberized neck brace. Works with most 10-hole harmonicas. The lead free copper reeds can be made to vibrate at varying frequencies to produce a beautiful sound and distinct tone. 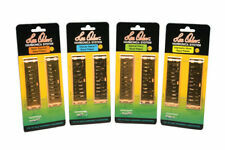 Available in the keys of A, Bb, C, D, E, F, G. 20 Brass Reeds with Lead Free Copper Plates. 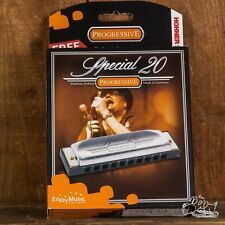 Especially good compatibility with pop and jazz, it hits the sister machine of blues type model MANJI among the Suzuki 10 hole harmonica. SUZUKI OLIVE C-20 A 10 hole harmonica. Suzuki 10 Halls harmonica "MANJI". The BIG SIX Blues is a standard diatonic harp in the key of C (holes 1-6 =12 tones) and is therefore suited best for playing in the second position. A real must-have - the BIG SIX with 6 holes! The BIG SIX is an eye-catcher with great playing features. ¢ Great sound because of stainless steel reeds also used in Seydel's top-model, the 1847. The BIG SIX Blues is a standard diatonic harp in the key of C (holes 1-6 =12 tones) and is therefore suited best for playing in the second position.